No other similar-priced metal roofing product offers this superior built-in edge protection. The first signs of corrosion on any steel roof nearly always happen where the roofing product has been penetrated by holes (to secure a satellite dish for example) or the cut edges necessary in any roof installation. Our unique alloy technology combines zinc, aluminium with magnesium. 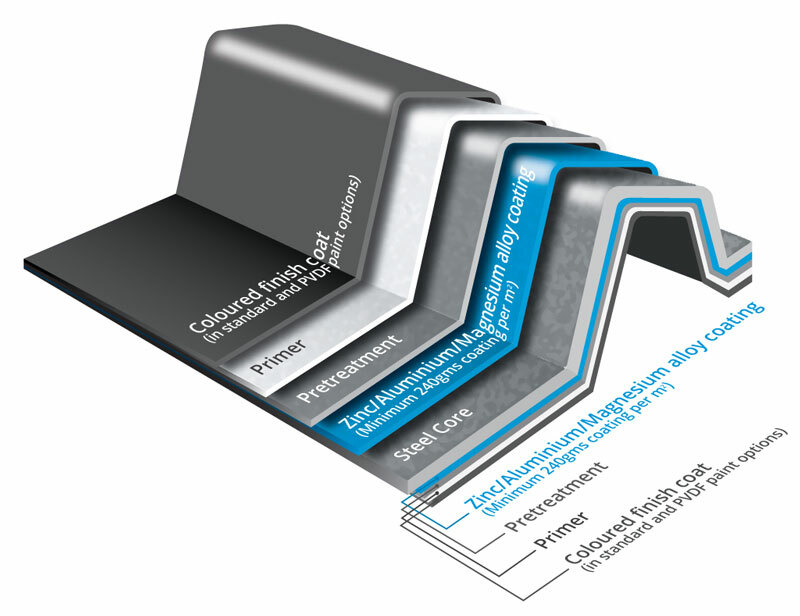 The magnesium allows the zinc to literally flow and self heal the cut edges that would otherwise expose the steel substrate to atmospheric conditions, ensuring a much longer life for your roof at a modest additional cost. With a thicker magnesium-containing metallic coating (minimum of 240gsm) than any other painted steel on the market, MagnaFlow is built to last longer in the tougher conditions. MagnaFlow has been the steel of choice in New Zealand for over 10 years in the challenging environments such as coastal, estuary, alpine regions and even the geothermal areas around the volcanic plateau. The right roof always lasts longer. MagnaFlow’s superior performance gives you confidence that you are choosing a proven solution. If you are building in an environment where corrosive chemicals may be present, MagnaFlow can also come with a thicker 70% PVDF top coat, under our MagnaFlow X sub-brand. Our ‘X’ paint system provides added protection against chemicals in industrial environments such as sites near airports, dairy factories or petrol stations as well as those in areas with geothermal activity. MagnaFlow is available in all the same great colours as UniCote so there’s plenty of choice to match with other features on your house. For full details download our Colour Brochure. This website is primarily to help you choose the right roof. When you or your team of professionals want all the technical details of MagnaFlow like design, engineering and installation requirements simply download our brochure or we’ll be happy to post you one. Depending on the environment, Pacific Coilcoaters offers warranties of differing lengths on MagnaFlow for residential buildings. *A warranty on MagnaFlow in ISO 5 is subject to prior approval by Pacific Coilcoaters. These are indicative and represent the maximum for each ISO zone. To receive a warranty customised to your location please use the warranty enquiry form.